2015 has begun with a bang at the NFB. As if on cue, having just celebrated its 75th anniversary, the NFB gets its 73rd Oscar nod. Nice! Meanwhile all six English Program studios are humming with creative energy, and a new batch of projects – documentaries, interactives and animation – is taking shape. Here are five to watch in ’15. There’s power in the podcast. David Christensen, executive producer of the Northwest Studio, was driving home to Edmonton when he happened to tune into Wall, a monologue by playwright David Hare on the security wall that Israel is building through the West Bank. Christensen and fellow NW Studio producer Bonnie Thompson enlisted the talents of director Cam Chistiansen, who’d made a splash with The Real Place, an evocative tribute to playwright John Murrell, part of an NFB series that honours recipients of the Governor General’s Arts Awards. The 2008 short met with enthusiastic acclaim at both TIFF and Sundance. When Sir David himself came onboard as scriptwriter, the project was on. 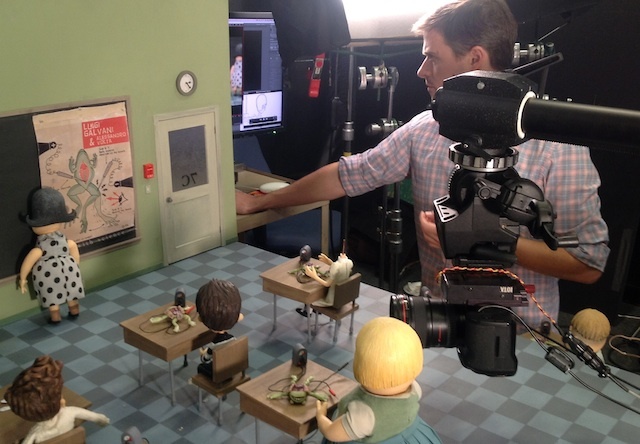 Cam got cracking on the NFB’s very first animated feature documentary. He is now well into production at his Calgary studio, employing cutting edge animation tools with a distinctive handcrafted aesthetic, drawing on material captured on location in the Mideast and 3D motion-capture footage filmed at London’s Pinewood Studios. “The Mideast takes up so much space in our media,” says Thompson, “but animation frees us to work with poetic metaphor, to represent reality in a whole new light.” Wall is scheduled for a fall release. 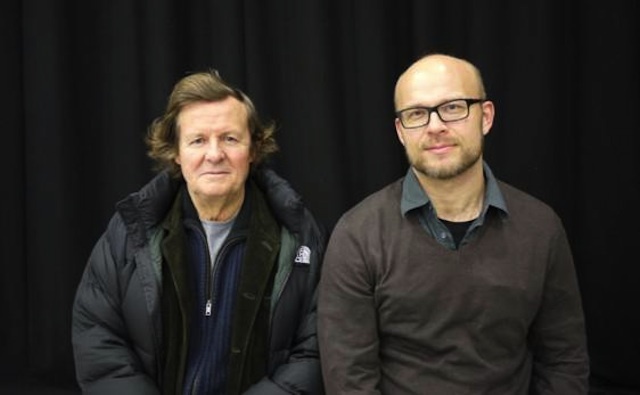 Pictured above: Sir David Hare and Cam Christiansen. The Hall Building—hub of Concordia’s downtown campus and former home to Sir George Williams University—is a Montreal landmark. It is also the site of the biggest student uprising in Canadian history. 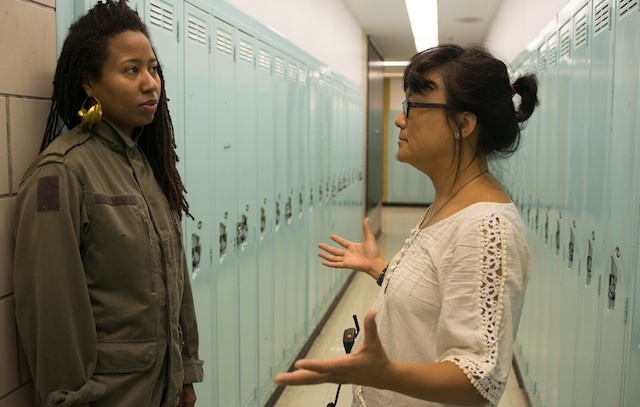 With Ninth Floor, a feature doc currently in production at the Pacific & Yukon Studio, fiction director Mina Shum returns to the documentary genre to investigate a defining moment in Canadian race relations and student politics. The 1969 Sir George Williams Affair, as it’s now known, began quietly enough, when six Caribbean students mounted a protest against perceived racism on the part of lecturer. But it ended in chaos and violence, with riot police storming the occupied ninth floor, and a storm of computer cards raining onto the streets below. “I’ve been hooked on this story ever since,” says Jacob, “and Mina brings a fresh perspective to it all.” Director of acclaimed features like Double Happiness, Shum had access to remarkable on-the-spot footage, unseen for decades, shot in the early days of videotape by students and staff. Editor Carmen Pollard has locked picture, and the online edit is scheduled to begin in March. Pictured above: Nantali Indongo, from band Nomadic Massive, featured in Ninth Floor, with Mina Shum. Gun Runners began life as a short, but has evolved into an ambitious feature doc that charts eight years in the lives of two young cattle rustlers — a documentary twist on Boyhood set within conflict-scarred northern Kenya. Directed by newcomer Anjali Nayar, a Montreal-raised journalist who’s reported extensively from East Africa, Gun Runners features Julius Arile and Robert Matanda, participants in a guns-for-amnesty initiative established by Tegla Loroupe, the first African woman to win the NYC marathon. Through athletic programs, and long-distance running in particular, she aims to rehabilitate young people embroiled in inter-community violence. The renowned Kenyan scholar Binyavanga Wainaina is onboard as story consultant, and Halifax-based editor Andrew MacCormack has worked closely with NFB editor extraordinaire Hannele Halm. Brendan Canning, founding member of the Toronto collective Broken Social Scene, is composing the original score. Release is scheduled for fall 2015. It happened sometime in 2008, a quiet but monumental shift in the world’s population pattern. We had become an urban planet. Kat Cizek, new media trailblazer that she is, had her finger on the pulse, and in 2009 the NFB launched Highrise, her ongoing multimedia interactive project about “vertical living” around the globe. Her most recent addition A Short History of the Highrise, made in collaboration with The New York Times, won the 2014 News and Documentary Emmy. Cizek is about to take it up another floor, applying the ethos of Challenge for Change to a contemporary cultural and technological reality. Universe Within: Digital Lives in the Global Highrise will feature 24 short webdocs, revealing the hidden digital lives within residential towers around the globe. Created with WebGL 3D technology, Universe Within will be accessible on all devices, with an enhanced version available on desktop. The project is produced by David Oppenheim in the NFB’s Ontario Studio. It is co-created with the up-n-coming digital agency Secret Location, and University of Toronto researchers Deborah Cowan and Emily Paradis. The project is due for a spring launch. What is it about Winnipeg that produces such inspired and idiosyncratic animation? The Prairie winters? Something in the water? 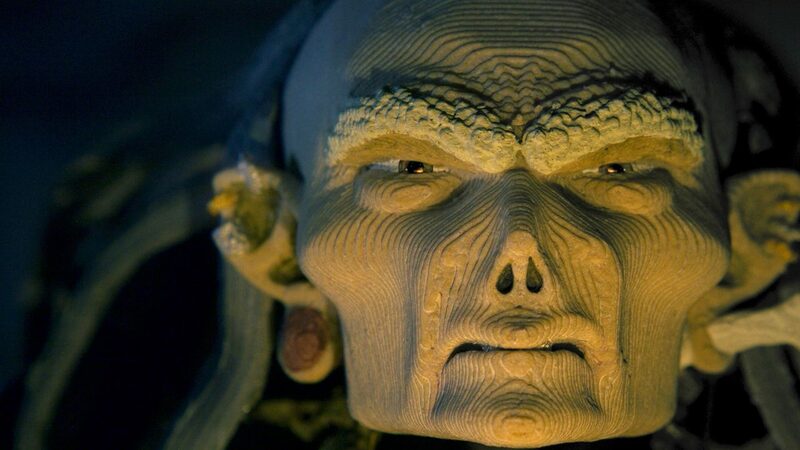 Cordell Barker, the wry genius behind The Cat Came Back and Strange Invaders, is at it again, hard at work on his first foray into 3D stop motion If I Was God — in which he goes back to primary school, dissects a frog, and ponders omnipotence. If I Was God is being produced by Northwest Studio. Producers are David Christensen and Michael Fukushima. Expect a release later this year. Pictured above: animator Dale Hayward, assisting Barker on the project.